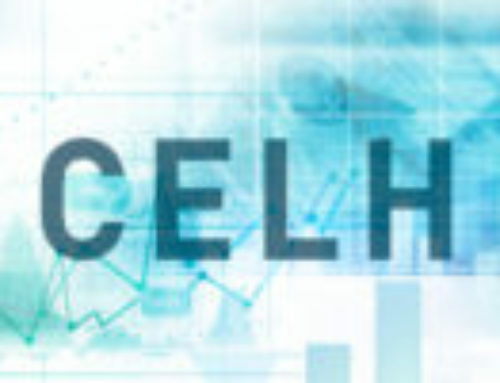 Celsius Holdings Reports Record Third Quarter Revenue Growth - Celsius Holdings Inc.
Boca Raton, FL (November 8, 2018) – (Nasdaq: CELH) Celsius Holdings Inc., maker of the leading global fitness drink, CELSIUS®, today reported financial results for the three and nine month periods ended September 30, 2018. For the three months ended September 30, 2018, revenue was approximately $16.6 million, an increase of $5.8 million or 54% from $10.8 million for same period in the prior year. The increase of 54% was primarily due to strong growth in North American sales revenue, which accounted for $5.4 million. The Asian Markets also reflected an increase of $988,919 in revenues when compared to the same period in the prior year. This was offset by a decrease in European revenues of $649,168 or 15% and a decrease of $1,551 regarding other international markets when compared with the same quarter in 2017. The decrease in European revenues was associated with our principal European distributor and customer lowering inventory levels, timing of new flavor launches and discontinuation of certain flavors. The net increase in revenues reflected additional sales volume, as opposed to increases in product pricing. For the three months ended September 30, 2018, gross profit increased by approximately $2.2 million or 47% to $6.9 million, from $4.7 million for the same quarter in 2017. In contrast, gross profit margins decreased 1.87pp to 41.5% for the three months ended September 30, 2018, from the 2017 quarter. The increase in gross profit dollars is mainly related to increase in sales volume from the 2017 quarter. The decrease in gross profit margins from the 2017 to the 2018 quarter was mainly attributable to increases in promotional allowances, slotting charges and increase production and repacking costs. Sales and marketing expenses for the three months ended September 30, 2018 were approximately $8.7 million, an increase of $3.9 million or 84% from $4.7 million in the same quarter in 2017. 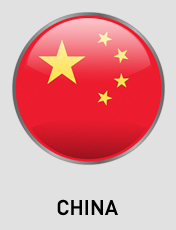 The increase is due primarily to marketing program investments, particularly in the China market, as well as investments in employee costs. General and administrative expenses for the three months ended September 30, 2018 were approximately $2.3 million, an increase of approximately $728,000 or 47%, from $1.6 million for the three months ended September 30, 2017. 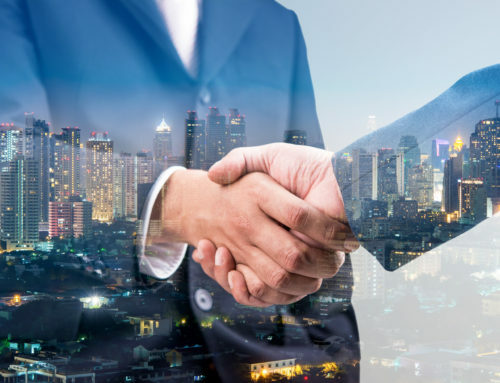 The increase was primarily attributable to increased stock-based compensation expense, increased employee costs and professional fees, which were partially offset by savings in other areas. Total other expense increased to approximately $43,000 for the three months ended September 30, 2018, up from $35,700 for the same period in 2017 as a result of higher interest expense. 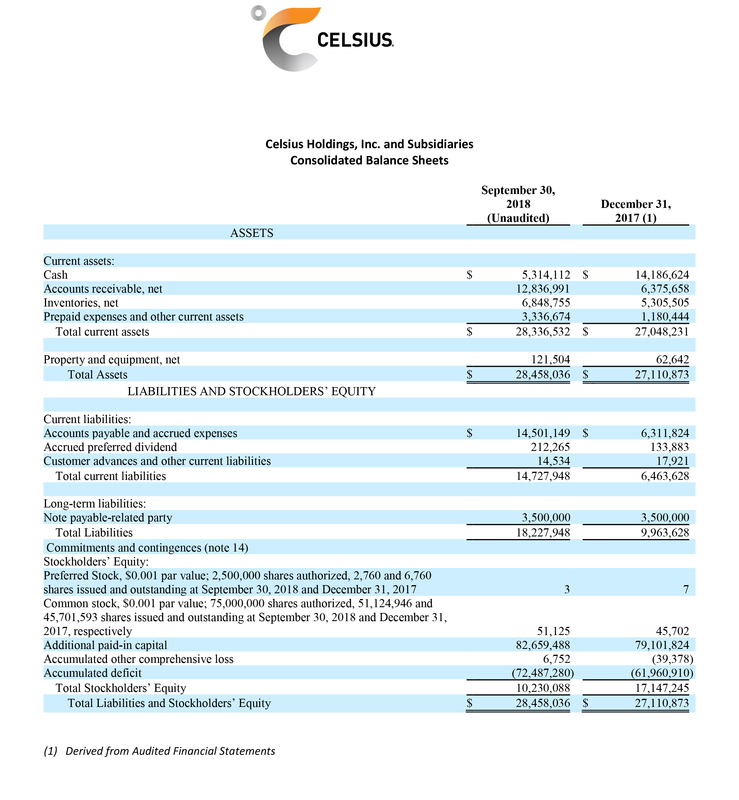 As a result of the all above, for the three months ended September 30, 2018, Celsius had a net loss of $4.1 million, and after giving effect to preferred stock dividends of $43,639, a net loss available to common stockholders of $4.2 million or ($0.08) per basic and diluted share based on a weighted average of 51,098,575 shares outstanding. In comparison, for the three months ended September 30, 2017, the company had a net loss of $1.6 million, and after giving effect to preferred stock dividends of $92,250, net loss available to common stockholders of $1.7 million or $(0.04) per basic and diluted share based on a weighted average of 45,487,908 shares outstanding. For the nine months ended September 30, 2018, revenue was approximately $37.9 million, an increase of $10.9 million or 40% from $27.0 million in revenue for the nine months ending September 30, 2017. The revenue increase of 40% was mainly attributable to strong growth of 61% in North American sales revenue to $28.0 million. In addition, revenues from Asian markets increased by $2.3 million and revenues from other international markets increased by $80,968; from the 2017 period to the 2018 period. This was offset by a decrease in European revenues of $2.1 million or 23%, from the 2017 period to the 2018 period. The decrease in European revenues was associated with our principal European distributor and customer lowering inventory levels, timing of new flavor launches and discontinuation of certain flavors. The net increase in revenues reflected was related to additional sales volume, as opposed to increases in product pricing. For the nine months ended September 30, 2018, gross profit increased by approximately $3.9 million or 34% to $15.6 million compared to $11.6 million for the nine months ended September 30, 2017. Gross profit margins decreased 1.84pp to 41.2% in the nine months ended September 30, 2018, from the same period in 2017. The increase in gross profit dollars is mainly related to increase in sales volume from the 2017 quarter. The decrease in gross profit margins from the 2017 to the 2018 quarter was mainly attributable to increases in promotional allowances, slotting charges and increase production and repacking costs. Sales and marketing expenses for the nine months ended September 30, 2018 were approximately $18.4 million, an increase of $9.2 million, or 99% from $9.3 million in the same period in 2017. 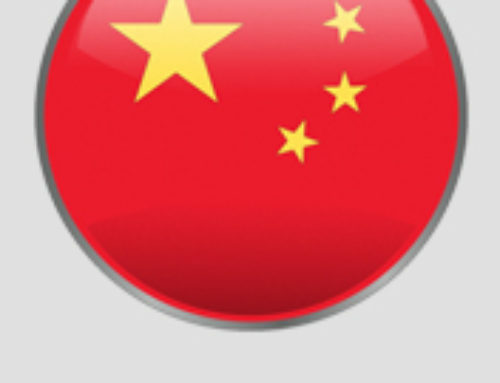 The increase is due primarily to marketing program investments including the China investment of $8.1 million, as well as increases in human resource investments in both the marketing and sales areas. General and administrative expenses for the nine months ended September 30, 2018 were approximately $7.4 million, an increase of $2.2 million, or 41%, from $5.3 million for the nine months ended September 30, 2017. The increase was primarily due to increases in stock-based compensation expense of $1.5 million, accrual of $945,000 pertaining to the settlement of a territorial dispute with a distributor and an increase of approximately $117,000 pertaining to research and development costs; partially offset by savings in investor related expenses of approximately $91,000 and in employee costs, consulting fees and other administrative expenses, for a net reduction of approximately $271,000. Total other expense was approximately $123,000 for the nine months ended September 30, 2018, roughly in line with $122,000 for the same period in 2017. 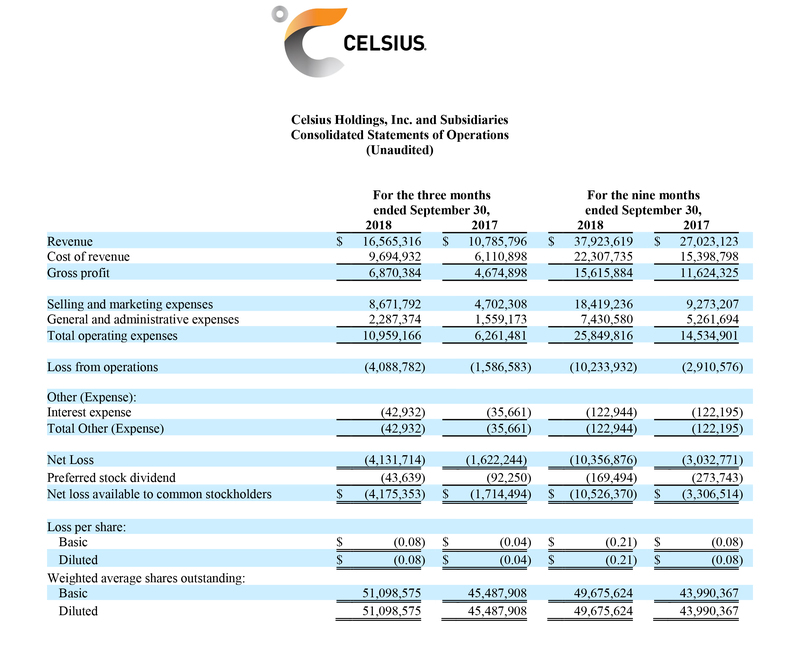 As a result of the all above, for the nine months ended September 30, 2018, Celsius had a net loss of $10.4 million, and after giving effect to preferred stock dividends of $169,494, a net loss available to common stockholders of $10.5 million, or ($0.21) per basic and diluted share based on a weighted average of 49,675,624 shares outstanding. In comparison, for the nine months ended September 30, 2017 the company had a net loss of $3.0 million, and after giving effect to preferred stock dividends of $273,743, a net loss available to common stockholders of $3.3 million or ($0.08) per share based on a weighted average of 43,990,367 shares outstanding. As of September 30, 2018, the company had cash of $5.3 million compared to $14.2 million as of December 31, 2017. 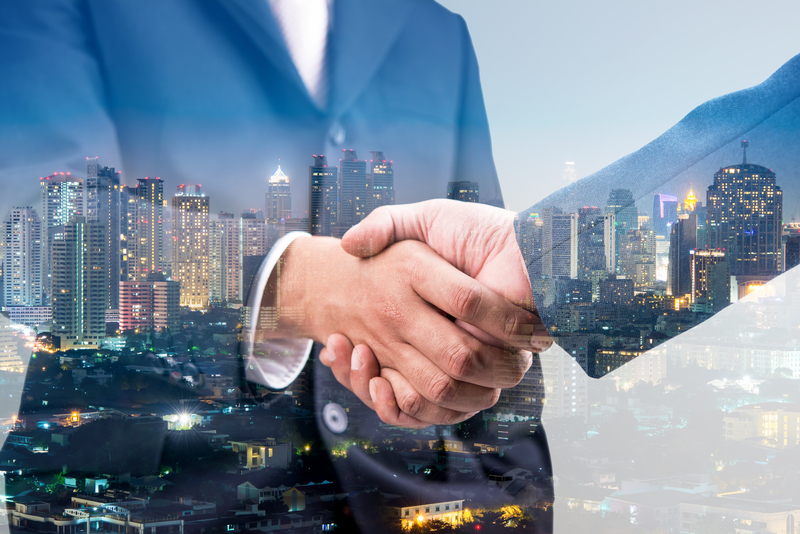 The company had working capital of $13.6 million as of September 30, 2018 compared to $20.6 million as of December 31, 2017. Cash used in operations during the nine months ended September 30, 2018 totaled $9.0 million. The company incurred a net loss of $4.2 million during the three months ended September 30, 2018, increasing the accumulated deficit to $72.5 million as of September 30, 2018. Management will host a conference call today, Thursday, November 8, 2018 at 4:30 pm ET to discuss the results with the investment community. 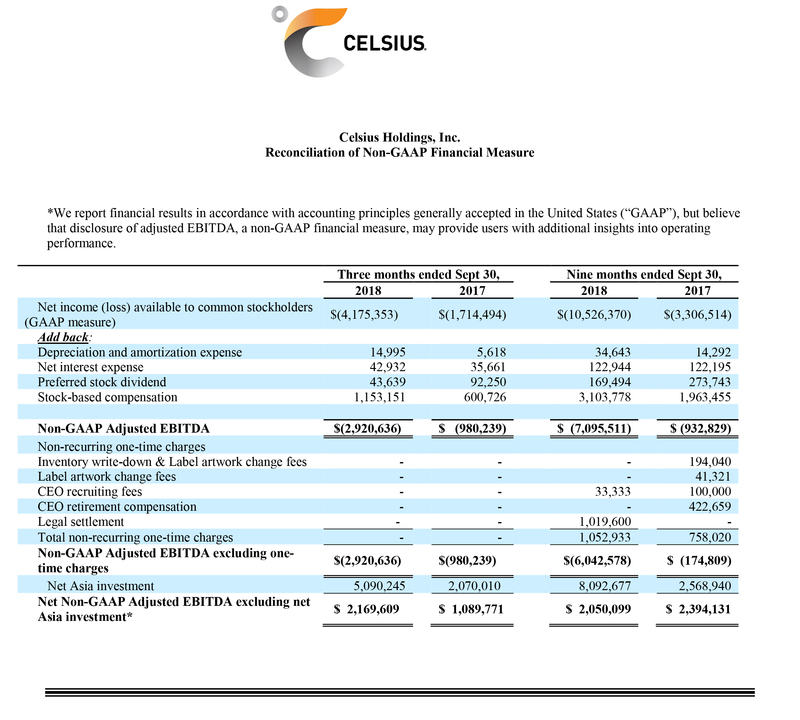 An audio replay of the call will be available on the Company’s website at http://celsius.com/press-releases/.